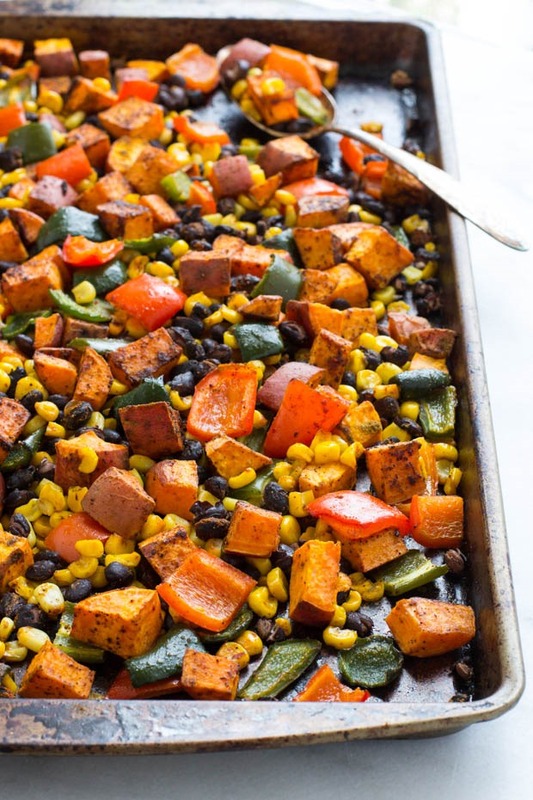 Nutritious sweet potatoes, peppers, black beans and sweet corn are tossed with Mexican seasonings and baked in one pan. Dinner has never been easier or more delicious! Vegan + gluten-free. Okay, this is so easy that I’m not really sure it should be considered a recipe. But I love it so much that I basically have no choice but to share it with you. It’s Mexican which is always a win in my book, it’s healthy and there’s virtually zero clean-up involved. It’s perfection in a pan, my friends. 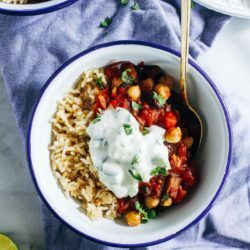 So it might not be a stroke of culinary genius but it’s a great option for a quick and easy weeknight meal. It’s kind of an in-between-seasons type of recipe. For one, it includes some of summer’s best produce: bell peppers, sweet corn, and jalapenos. On the other hand, one of the main ingredients is sweet potatoes which are usually available year round but technically aren’t in-season until the fall. That said, I feel like now is the best time for dinner like this. Peppers and corn are still hanging around and fresh sweet potatoes will be popping up any minute. It will also be getting cool enough to turn on the oven soon and that’s pretty much all you have to do make this. To start, you chop up the sweet potato and toss it with a little oil and seasoning. Bake that in oven for 15 minutes while you chop your other veggies. Then when the potato is done, you throw the peppers, corn, and black beans on top with a little more oil and some more seasoning, stir it all together and pop it back in the oven for another 15 minutes. Once everything is nice and roasted and smelling fantabulous, that’s it! Bing, bang, BOOM. My favorite way to eat it is layered on top of a bed of baby spinach then top it off with salsa, a squeeze of lime juice, avocado, some cilantro and maybe just a little shredded Mexican cheese. Ugh, SO GOOD. Of course you can leave the cheese off if you want to make it vegan or dairy-free. 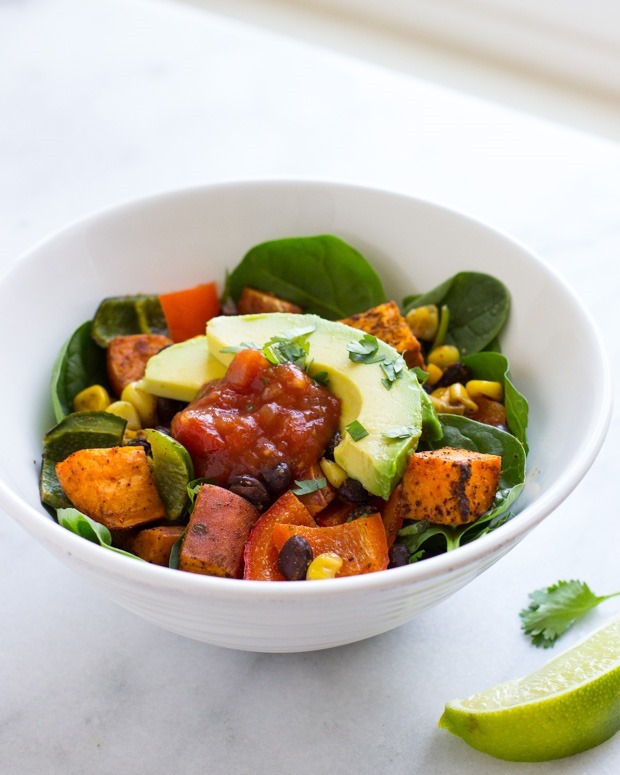 Trust me, if you love Mexican food and sweet potatoes then you’re going to go crazy over this one! 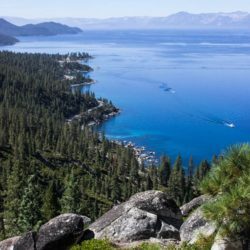 Enjoy, friends! Preheat the oven to 400°F and grease or line a baking sheet with parchment paper. 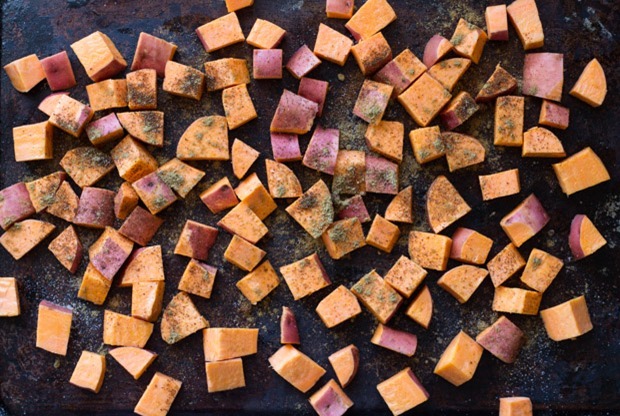 Place the diced sweet potato on the baking sheet and then use your hands to coat them with 2 tablespoons of the oil. Sprinkle them with sea salt and bake in the oven for 15 minutes. Next remove the baking sheet from the oven and set aside. 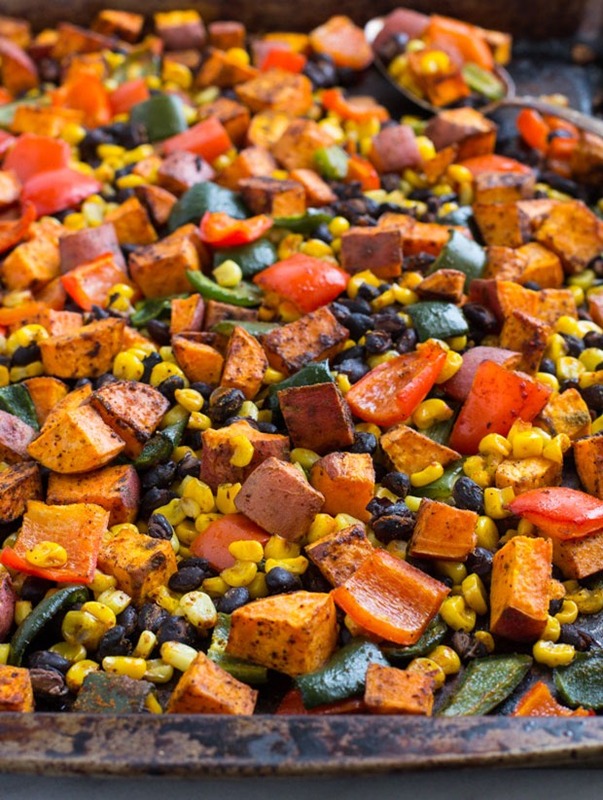 Place the drained diced peppers, beans, and corn on top of the sweet potatoes then add the remaining tablespoon of oil. Sprinkle the seasonings on top then use a spoon to stir everything together. Bake in the oven for another 15-20 minutes, until the potatoes and the peppers are light brown on the edges. Allow to cool for 5 minutes then transfer to a bowl with desired toppings and enjoy! Side note: I prefer to layer everything on a bed of baby spinach and top with shredded cheese, salsa, fresh lime juice, avocado and/ or cilantro. You read my mind! 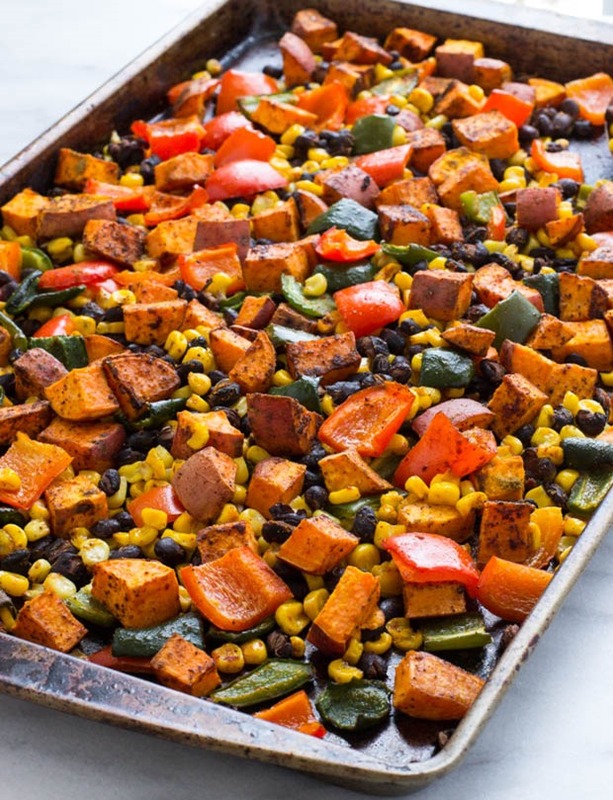 I’ve been roasting sweet potatoes all week and I’m trying to incorporate more gluten free meals into my week :) This is perfect- pinning! 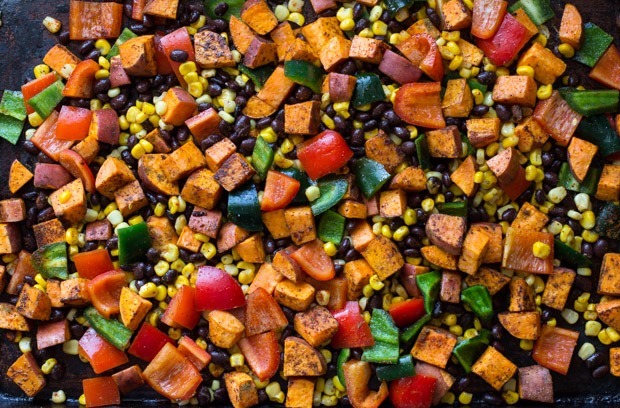 This looks AWESOME and I love that it can all be done in one pan! 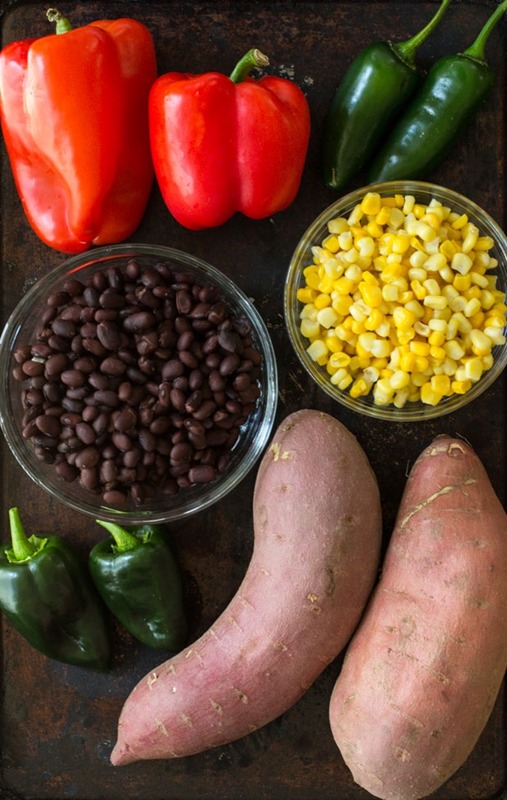 Usually I have one pot with beans, one with corn, one with sweet potatoes… etc. Then I feel like I’ve used every pot in my kitchen and clean up is no fun haha. Such a great easy dinner! Love all the roasted veg! Just pinned this and will definitely be making it this weekend! 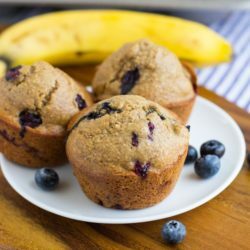 I feel like this would be great with eggs too! Correction: I couldn’t wait until this weekend and made it last night. 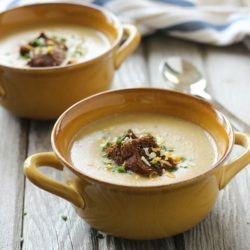 SO good and I love how it makes a big batch for leftovers! Aw, I’m so happy you liked it!! Thanks Katie! Ahhhhh!!! This looks amazing! What a beautiful recipe! I’ve been loving 1-dish meals as of late. They’re just so comforting… and ones like this, nourishing! Thanks for the recipe! How you love it sounds amazing! 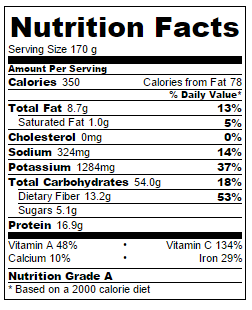 With spinach… yum! Culinary genius is overrated–I’m all about THIS. Simple and actually makeable. ….which is apparently actually a word. Who knew? This was so simple to make and came out beautifully! 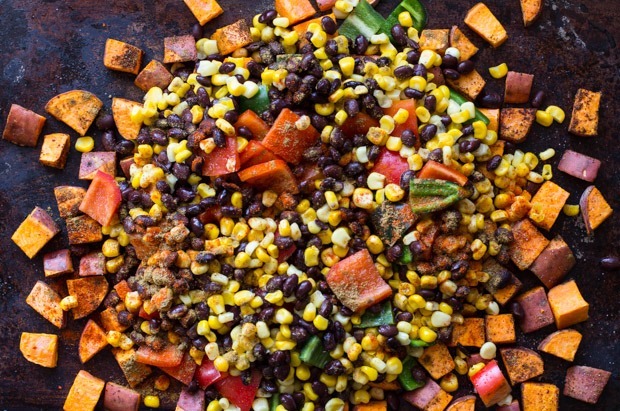 Love this combo of sweet potatoes, peppers, corn and black beans – easy, hearty and DEEEELICIOUS! 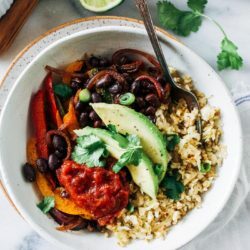 Quick, easy, nutritious, and Mexican?! Perfection in my books! :D Seriously, I could put salsa and guac on almost anything and be perfectly happy with it, but I’d much prefer those be toppings to something like this. Love it! No mention of peeling potatoes, so you don’t? This was a delicious part of our dinner for the vegetarians. Served it in tortillas with avocado, salsa, limes, grated cheese and sour cream. Thanks so much for an easy, delicious meal! This was fantastic! When making tacos or enchiladas I usually make Mexican rice, but I was looking to switch it up this time, so instead I made this dish to accompany the tacos, and it was perfect! I used poblano pepper instead of jalapeño to make it more palatable for others sensitive to the heat. Thank you for the inspiration! Came back to this recipe just to say this is SO GOOD! I used it as my lunch prep for the week and it fed me for 5 meals ( I spilled some of the veggies in the oven trying to take them out :( But yes with the lime juice! I even put this stuff in a wrap with cheese :) so great, thank you for sharing! This was great but it needed to cook much longer. I used yams instead of sweet potatoes as they are much healthier for women. So maybe they take more time to bake…? Just wanted to say that we have made this dish about fifteen times now. Since becoming parents we’ve found it challenging to cook and this well balanced dish has become a staple in our home. Thank you so much for this. Bomb dignity. I just made this exactly as the recipe said but somehow it was overflowing from the pan. Not that I’m mad… I love leftovers. This is so delicious. The perfect blend of flavors.